THE PANO MAN: Professor Brian Lawler poses with his trusted assistant, the GigaPan computerized camera mount. Brian Lawler is doing better now, he would want you to know. Lawler, the Cal Poly professor of Graphic Communication whose panoramic photography exhibit opened at SLO Museum of Art on Valentine’s Day, was hit by a truck while riding his bike Jan. 27, resulting in a broken pelvis. But thanks to good care and lots of painful physical therapy, he is slowly working his way back to his normal activities. And those activities are many. 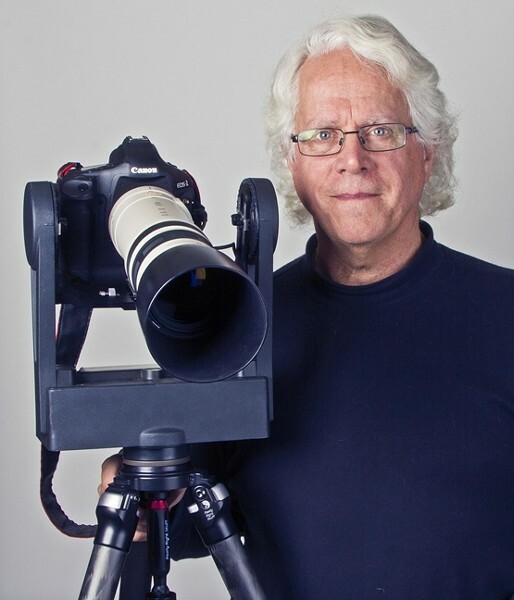 Lawler’s “day job” is teaching Graphic Communication, though he is also a photographer, graphic arts consultant, typographer, photographer, and photojournalist. The panoramic photo exhibit, which runs through March 30, has been a side project two years in the making. The exhibit represents an extraordinary view of San Luis Obispo history, and the story of how the photos came to be reproduced provides an interesting historical chapter as well. In the early 1900s, a local commercial photographer named Frank Aston took a series of panoramic photos from key locations in the region. Using a motorized camera called a Kodak Cirkut and a special tripod to rotate it, Aston captured remarkable detail in landscape vistas. His works included views from Terrace Hill and the (now destroyed) Avila Beach railroad bridge, as well as scenes of oil tank construction at Tank Farm and a group portrait of the 194 members of the Independent Order of Odd Fellows, circa 1914. Lawler’s project was to recreate a selected group of Aston’s photos as closely as possible. In doing so, he has created both a new series of beautiful images and lasting historical documentation. However, in order to even reproduce the images, Lawler had to jump through some serious hoops. The Aston photos came to Lawler by a circuitous route. The unprinted film negatives had been languishing in a garage during two major San Luis Obispo floods and were by then glued together in a solid brick of silt. Lawler’s first challenge, then, back in the ’80s when his friend, historic archivist Gordon Bennett, brought them to him, was to actually get to the images and print them. After getting some advice from the George Eastman House photography museum in New York, Lawler was able to salvage a good number of negatives. At that time Lawler ran a company called Tintype Graphics, but even their advanced equipment wouldn’t allow him to print the photos in any viable way. So again, the priceless negatives were put in a box in a garage, this time Lawler’s. VIEW FROM THE HILL: Pictured is the view from Terrace Hill on a rare day of green grass in San Luis Obispo. Last summer, Lawler got the box of film out again, in the hopes of adding something to his upcoming panoramic exhibit at the SLO Museum of Art. He decided on five panoramic scenes to recreate from the old photos, grabbed his camera, and headed off to shoot. The scenes he set out to recapture for comparison comprise key aspects of San Luis history: the open oil tank that led to the most devastating explosion and fire in San Luis history, a view of Camp San Luis Obispo fully occupied by soldiers and tents in the years leading up to World War II, the stretch of Avila beach and pier taken from a railroad bridge that is no longer standing, the Oddfellows group standing in front of the original courthouse, and a breathtaking view from Terrace Hill of the city of SLO nestled comfortably in between its morros—a hill that Lawler says has had approximately 60 feet removed from its peak since the original photo. The process used to create these amazing images involves his camera of choice, the Canon 1DS Mark III, with various lenses, and the GigaPan. The GigaPan is a computerized robotic camera mount that actually takes the pictures once the user has programmed it with the necessary specifications. The pursuit of the perfect, high-resolution image has made Lawler into an inventor, as well as a photographer. For hauling his heavy tripod up mountains to get the shot, he transformed a Kelty aluminum-framed backpack into a lighter-weight tripod carrier. For the panorama exhibit, he created a new way of viewing the images called Panodomes—essentially a tent made from the photograph printed on Lycra and stretched around and over a dome. The viewer ducks inside and is engulfed by the image—for this exhibit, a canopy of live oak trees and the sky over Bishop Peak. While he has had a varied career, including being a filmmaker, a “stringer” for KSBY News, and a corporate technology product evangelist for companies like Apple and Kodak, Lawler knew he wanted to be a typographer from a very young age. NOW THAT’S A SKY: Clouds go on forever over Greenfield, CA, in the Salinas Valley, in this panorama taken by Brian Lawler. When he was 11, he started a basement business with a printing press given him by his grandfather, selling mostly to friends of the family. When he hit his teens and his interest flagged in school, his parents took him for a motivating visit to Cal Poly to show him the department that would someday become Graphic Communication. It worked. He told his parents then and there that he was going to go to Cal Poly and work in typography. Lawler started at Cal Poly in 1969 after a stint in the Coast Guard. Once he was finally at his dream school, he was disappointed in what he thought were the limits of the technology he saw there in the Typography Department. While he loved typesetting and the machinery that had been used for decades, he realized he felt trapped in a field that had already passed its pioneering days. But that feeling changed the day they brought the new phototypesetting machine in. This was the first generation of computerized phototypesetters, introduced in 1969, and it changed his life. “I realized that this wasn’t the end of something; this was the beginning of something,” he says. Lawler worked various jobs after graduating college, eventually spending nineteen years running Tintype Graphics, a labor of love for him. Following that came his years as a product demonstrator for the top tech corporations until the events of 9/11 essentially put a stop to international corporate travel for a while. While you won’t hear the professor pining over the loss of the “warmth” of film versus digital video, or the bad old days of manual photographic processing, Lawler does wax a bit nostalgic over the old by-hand printing presses. He is advisor to Cal Poly’s Shakespeare Press Museum, a collection of rare letterpress equipment, handset type, and printing papers. He makes his advanced students of typography learn to print on the machines to get them a real sense of the tactile origins of their chosen field. He wants students to know, for example, that the term “leading”—the space between lines of type, which rhymes with “sledding,” by the way—comes from the actual placement of a piece of lead between the rows of type. “Also, I want the students to experience the tactile experience of letterpress printing, because it’s very cool,” he says with emphasis. ZOOM IN! : For a peek into what drives and inspires this artist and teacher, see his website and blog at thelawlers.com. On Friday, March 7, Lawler will return to SLO Museum of Art to give another lecture for Art After Dark, and on Saturday, March 8, at 2 p.m. he’ll be repeating his technical demonstration at the museum. Some of Lawler’s panoramic images from around the region and the world can also be seen interactively on Gigapan.com, where you can zoom in and search the photo details to your heart’s content. One thing that his students like to tease him about is his involvement—indeed, his responsibility—for the look of SLO street signs. The font, called Libra, was used on his recommendation after city officials asked for his help in coming up with something that captured the flavor of our town. “Spanish heritage, crisp, not too old-fashioned and not too modern,” Lawler says of their specifications. He was thrilled when they decided to use his recommendation on the sign welcoming visitors into the city and on civic buildings. But he was appalled when years later he saw that same font being used for street signs. It’s just too big and illegible, he points out. A chance assignment while working for KSBY also jump-started Lawler’s interest in hot air ballooning, first as a crew member and then eventually as a licensed balloonist. His face lights up as he describes piloting a balloon high above open fields. I point out that it’s all about stepping back and seeing things from afar with him, and he agrees. “What is it about panoramic that appeals to you?” I ask, and Lawler’s response is enthusiastic. Intern Victoria Dale can be reached via Arts Editor Erin C. Messer at emesser@newtimesslo.com.